We recently shared with our readers that upscale food trucks were one of the elements currently influencing emerging food trends. Proof that these rolling ethnic kitchens are here to stay (and increasing in popularity) is the fact that in New York City food truck owners have formed a representative trade group and hired a lobbyist. A total of thirty-two culinary entrepreneurs, who street market everything from uniquely flavored ice creams to the very popular Korean tacos, have contracted with Cacalino and Company to represent their concerns from quicker food licensing to street parking rights. David Weber, president and a co-owner of the Rickshaw Dumpling Trucks, believes the move is necessary as there is a negative stigma from former eras that doesn’t fairly apply to contemporary gourmet food trucks. Disregarding any past negative marketing images, currently even some established restaurants are currently investing in this hot new food outlet format. Some food trucks have, indeed, become so popular they’ve “lost their wheels” and become a traditional brick-and- mortar restaurant. Changes can’t come too soon as the daily increase in the number of trucks intensifies the struggle for parking places between vendors. Added to the mix is the decision by New York City to ban the trucks from metered parking areas, all the while adding more car-only meters daily to increase the city's declining revenue funds. Let’s hope it all works out and that there’s space and a place in the Industry for everyone willing to create and care about quality and innovation. 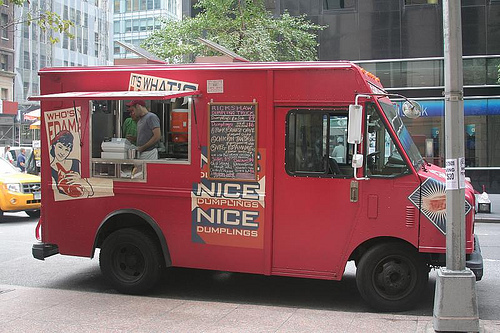 Post Note, November 2, 2011: As they say there's an app for everything soon or later and now that's true regarding your favorite food truck. Tweat.it has just launched their new app which will enable hurried hungry diners to find the location of their favorite NYC food truck quickly. Hopefully the app will soon expand to other cities worldwide so we can all catch our favorite eat on the run. 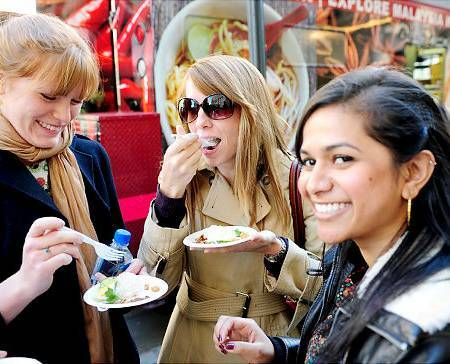 Posted on March 24, 2011 by Ana Kinkaid and filed under Food Trucks, Restaurants, Trends and tagged Cacalino & Company David Weber Korean Tacos Lobbyist New York City Rickshaw Dumpling Trucks Trade Union Tweat.it.